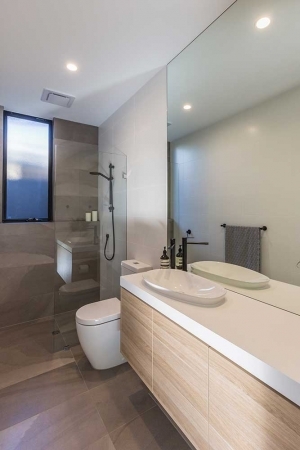 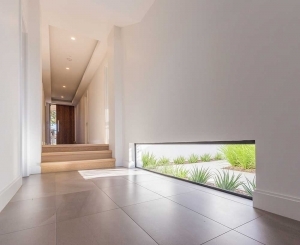 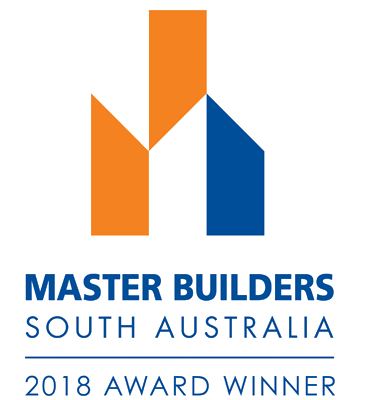 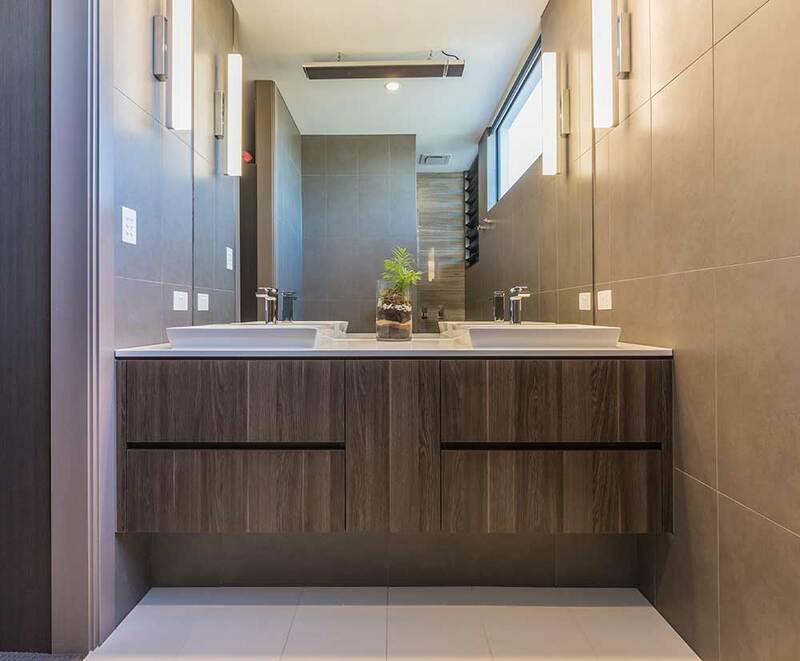 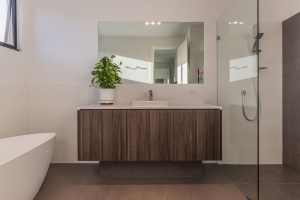 The Building Supervisor was onsite continually throughout the 32-week construction to ensure the home was completed on time and to the highest quality of finish. 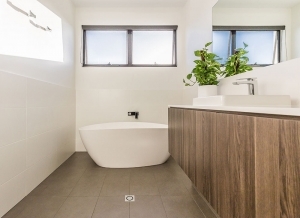 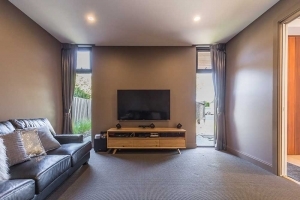 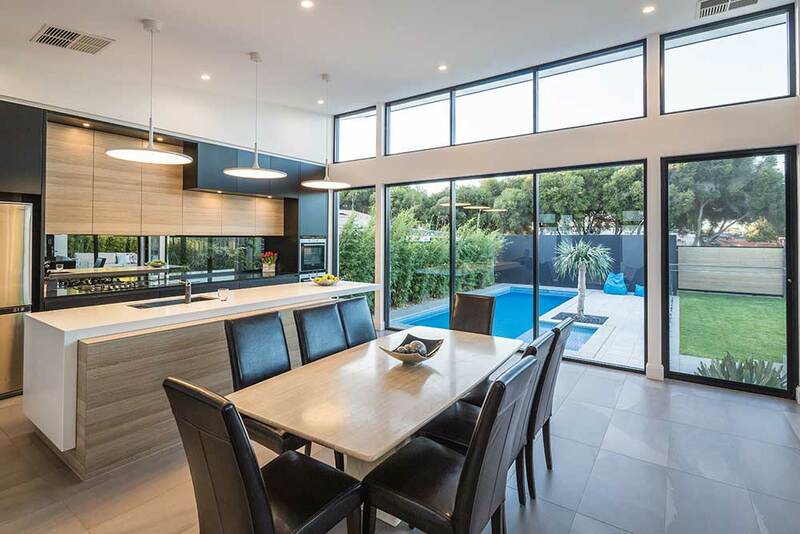 The client had a clear vision of the home and was involved in the concept design through to material and colour selections and construction details. 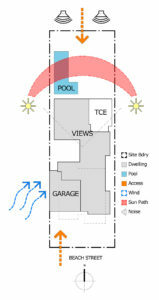 The floor plan is thoughtfully designed to zone communal living spaces and private retreat areas. 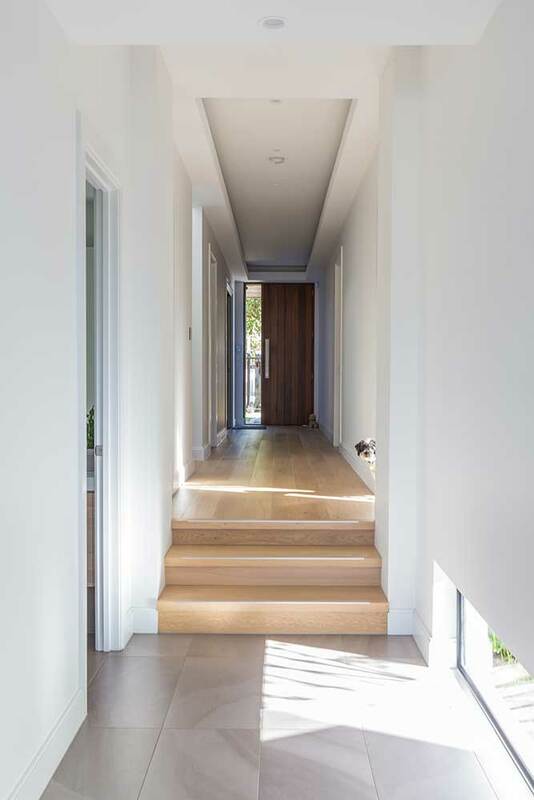 The split levels of the home cleverly define layers of privacy, with the lowest level is the communal living space of the home; the open plan Kitchen, meals and sitting area is positioned to capture views to the internal courtyard and rear garden. 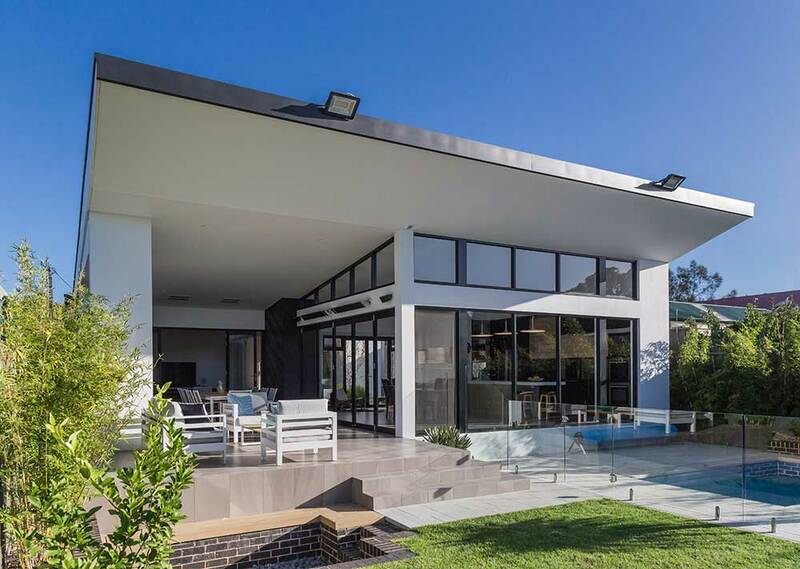 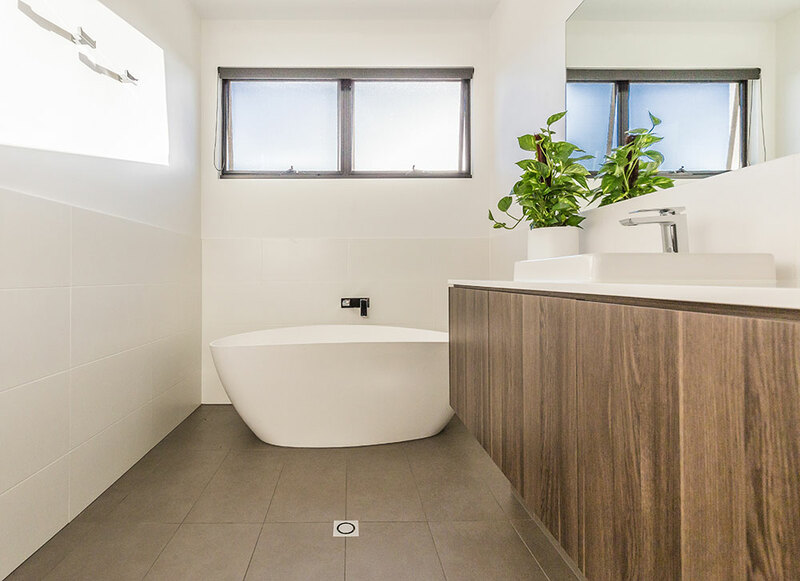 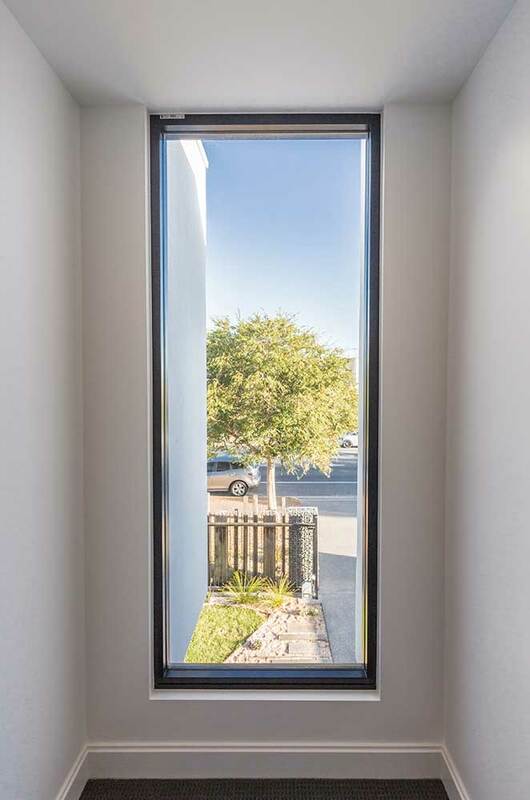 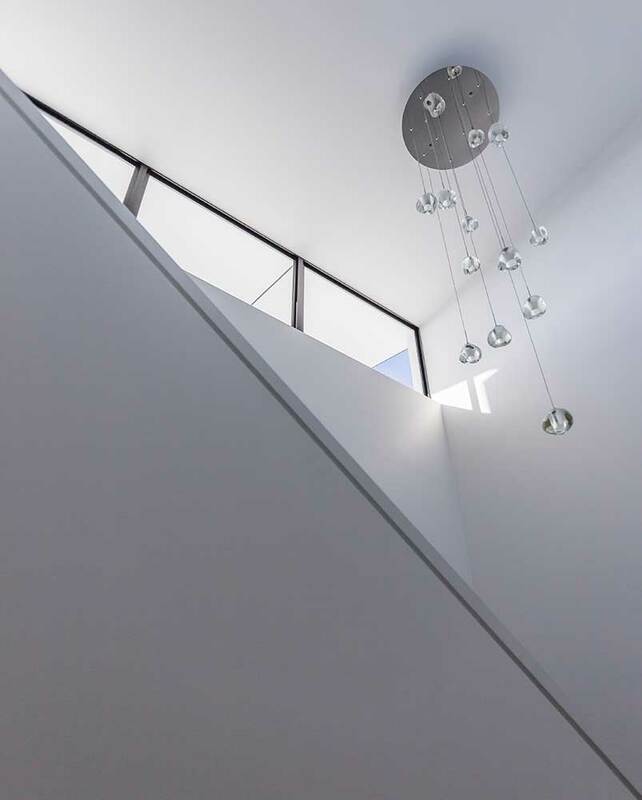 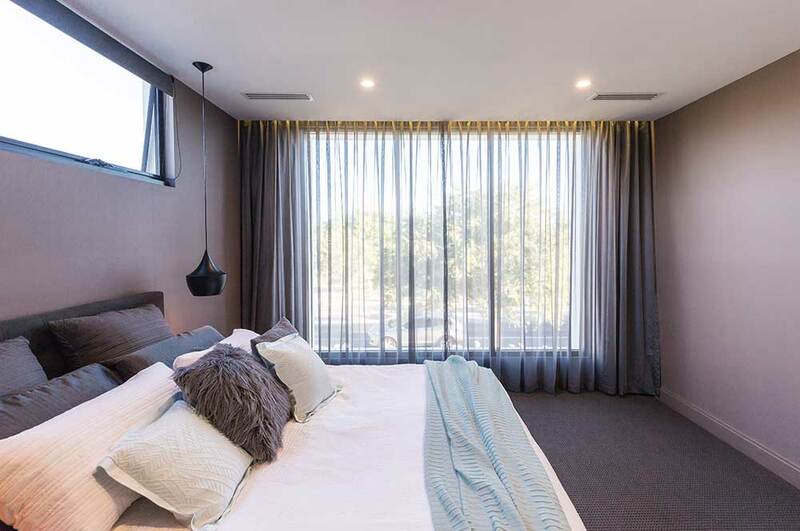 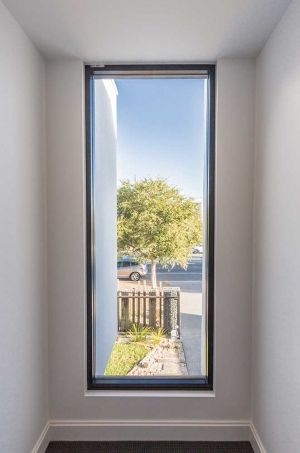 The skillion roof integrates high level windows allowing the space to be flooded with natural light and draws you into the heart of the home. 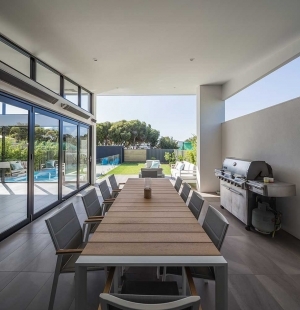 Bifold doors open the meals area onto the alfresco blurring the boundary between internal and external space. 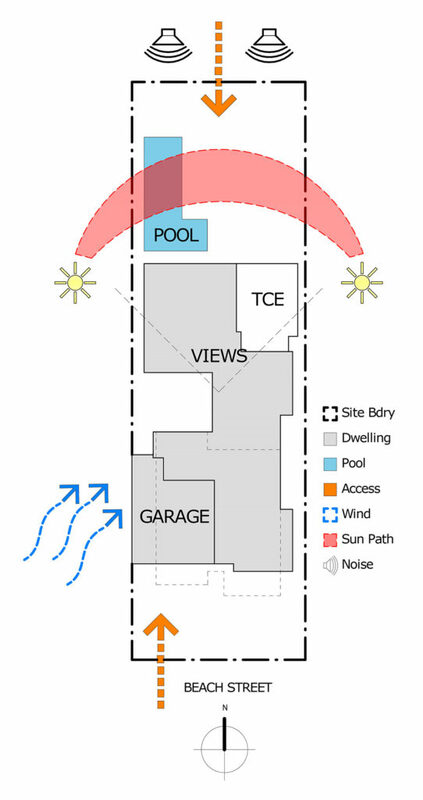 Finally, the upper level is the private zone, with all the bedrooms and bathrooms. 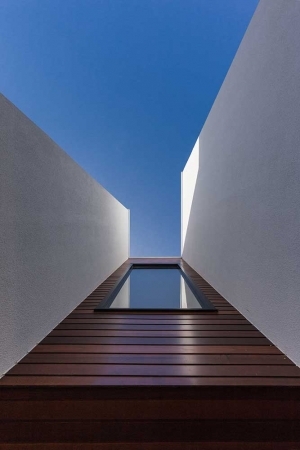 A series of projecting boxes craft a series of spaces which open to the outside. 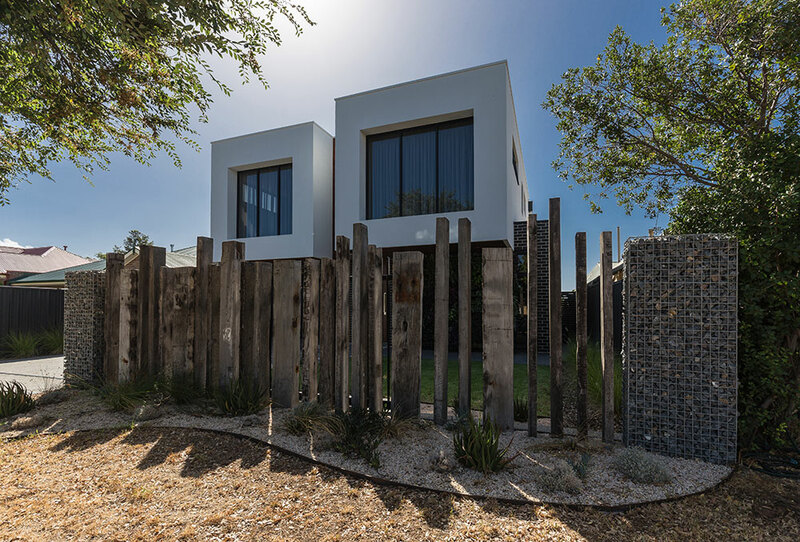 The boxes shape the interior defining the boundaries of private and communal space. 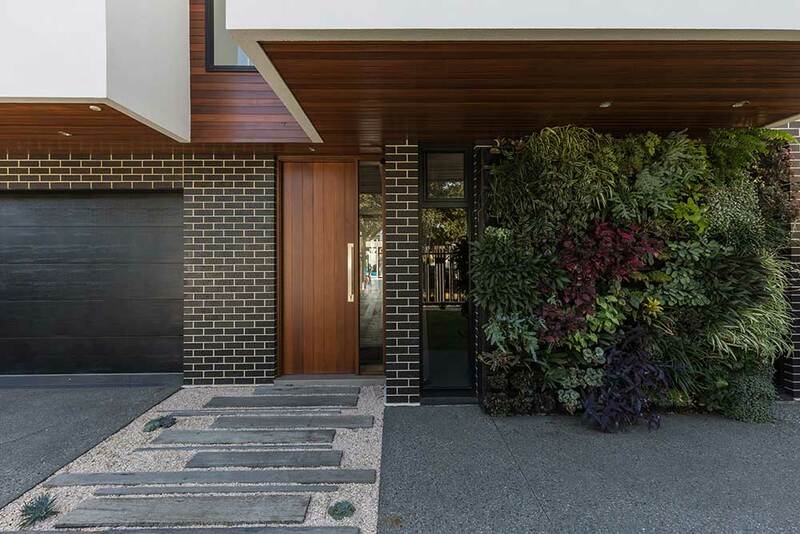 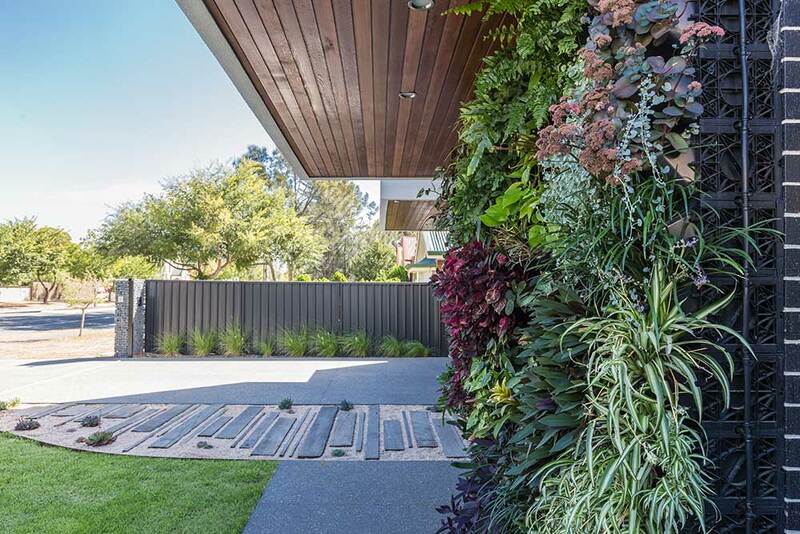 Western Red Cedar shiplap cladding and soffit lining was used to accentuate the protruding elements on the front façade which is balanced by softness of the green wall. 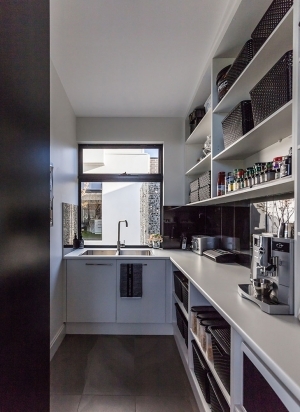 The Kitchen is a masterful play of contrasting materials and colour. 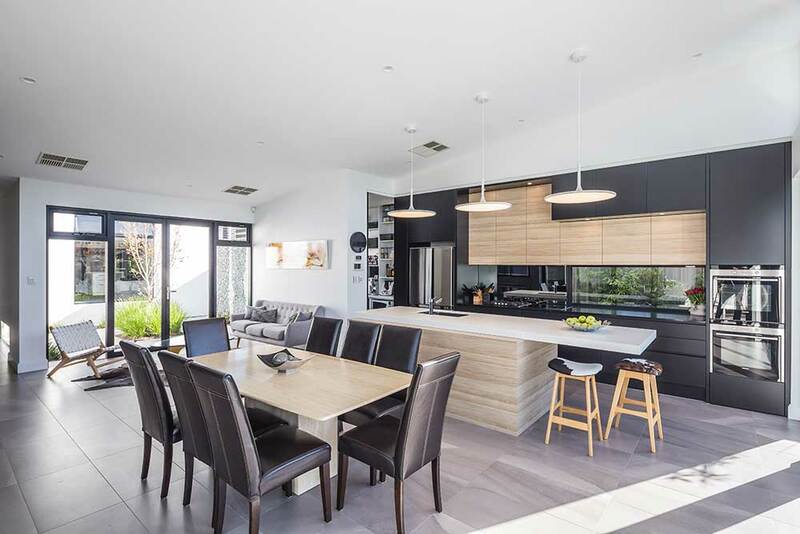 The black joinery is balanced by the warmth of timber used in the overhead cupboards with an asymmetrical island bench design overlooking the magnificent pool. 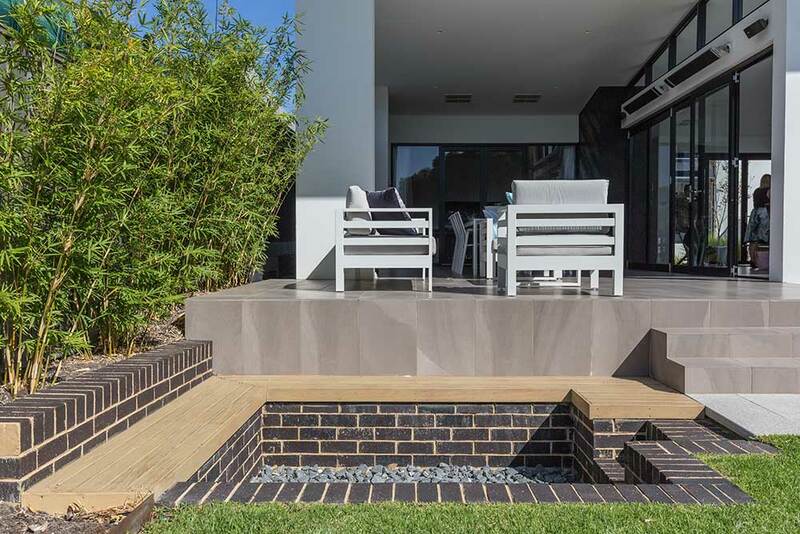 Adjacent to the family is a spacious tiled alfresco that steps down to a sunken firepit. 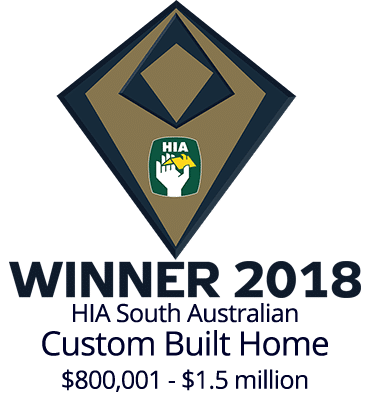 The home bursts with the highest quality fixtures and finishes including direct stick timber flooring, curtain pelmets in the master bedroom and Bedroom 2, acoustic insulation to upper level internal walls and built-in gas fireplace. 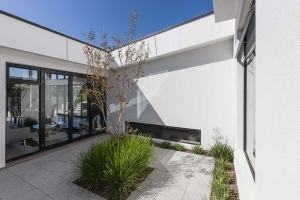 There is a masterful play of light throughout the home by combining an internal courtyard with large windows which together promotes cross ventilation in the open plan living area. 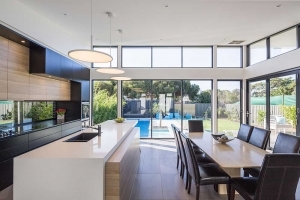 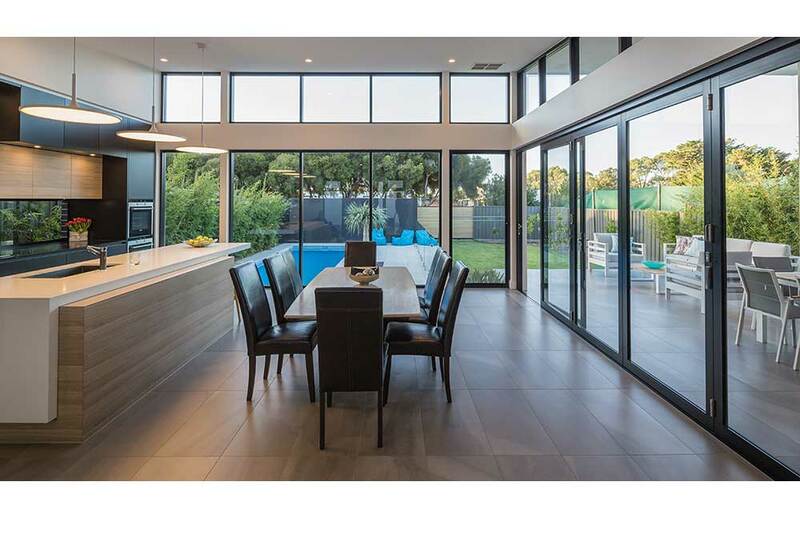 The North-facing kitchen, living and family filter winter sun to the centre of the home while the expansive eaves shade the windows in summer, which together minimise mechanical heating and cooling assistance. Furthermore, Comfort Plus glazing was utilised on the upper floor Western façade to the bathroom, WC and Bedroom 2 windows to minimise solar gain. 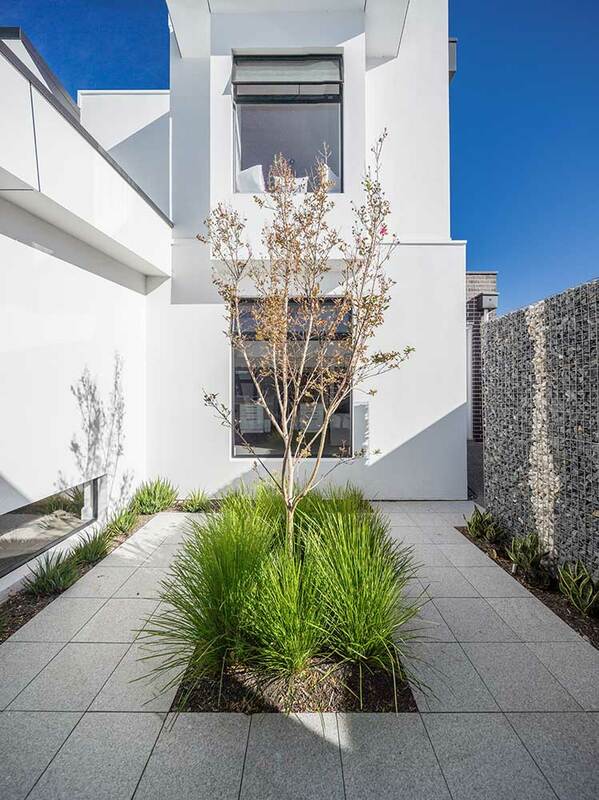 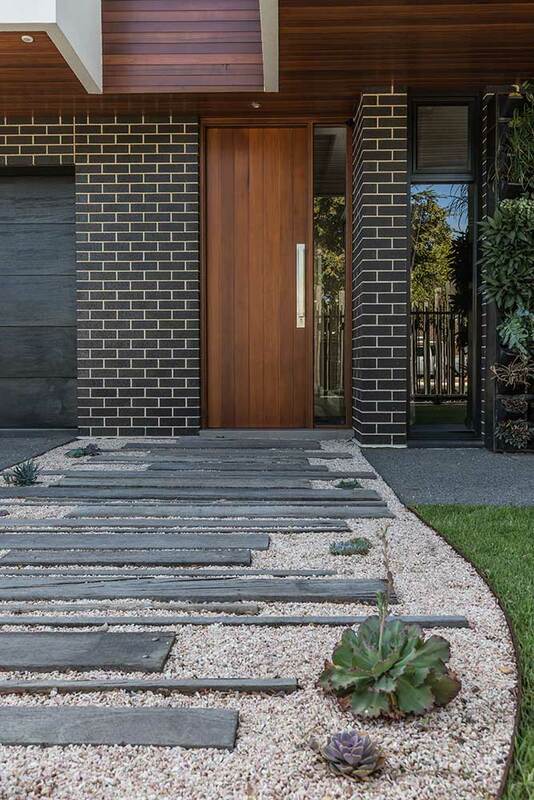 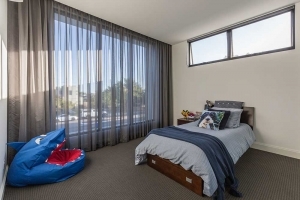 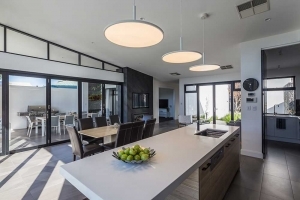 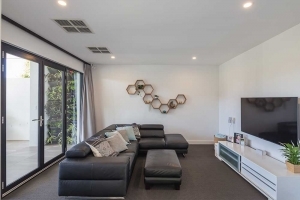 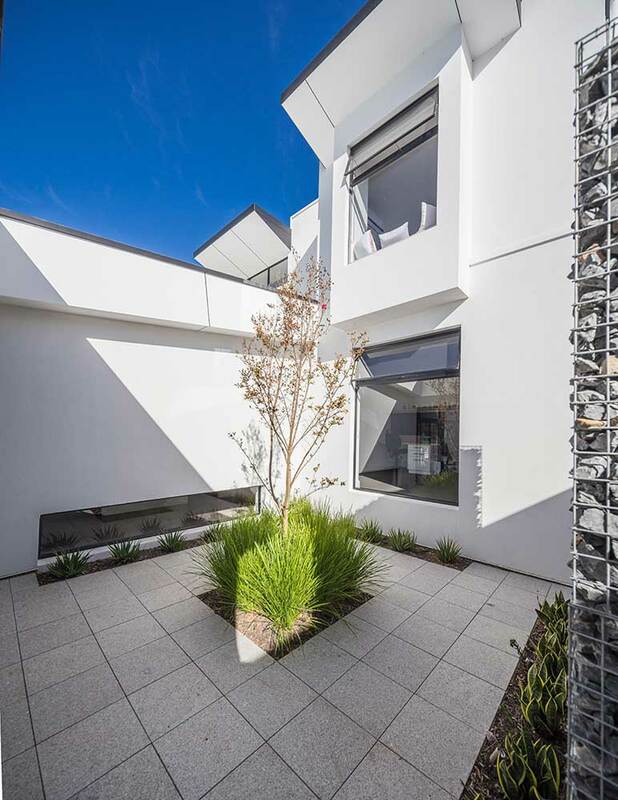 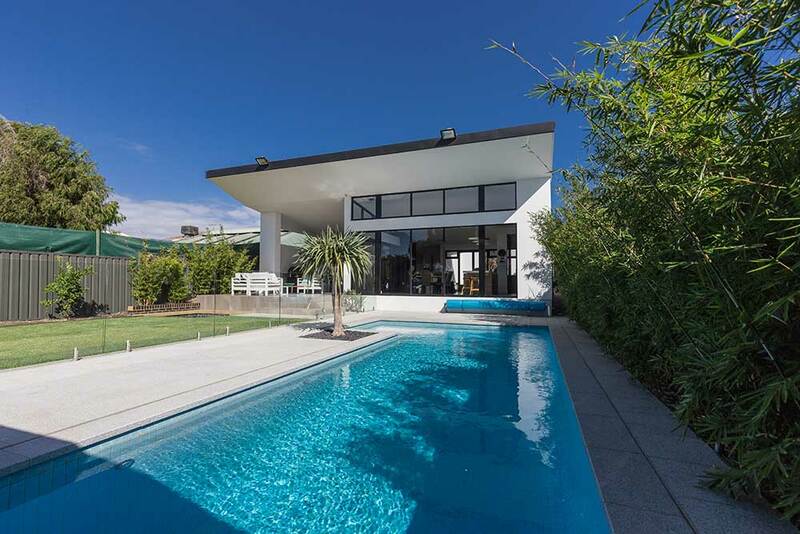 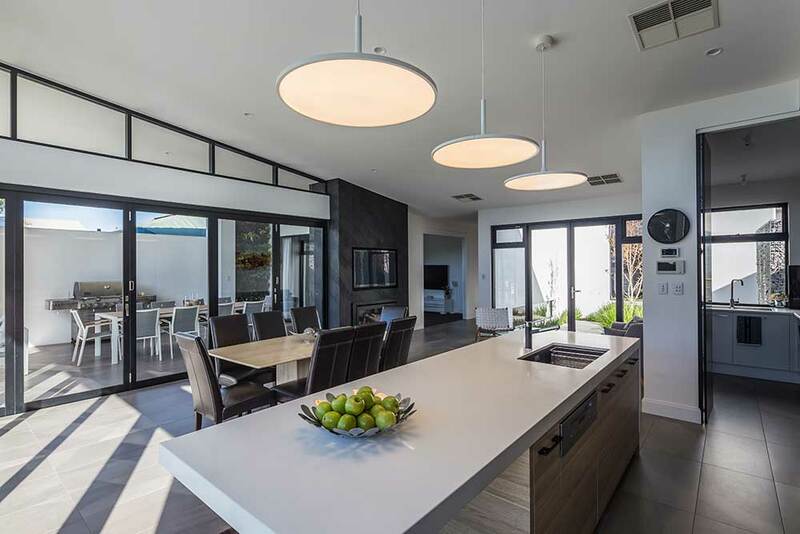 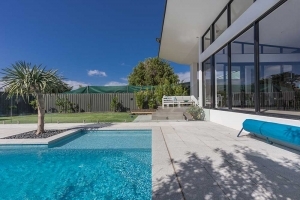 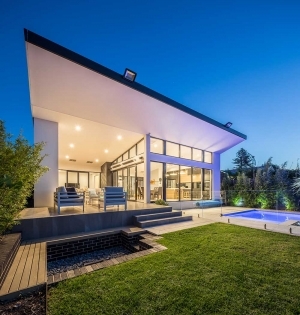 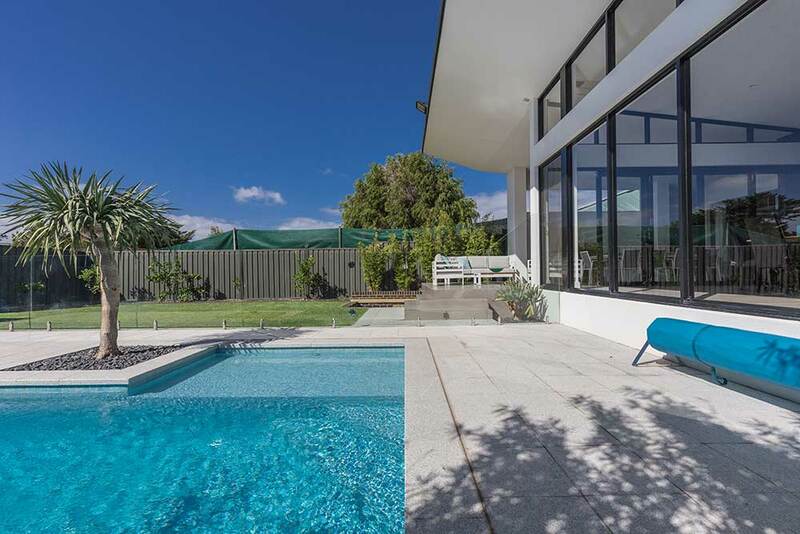 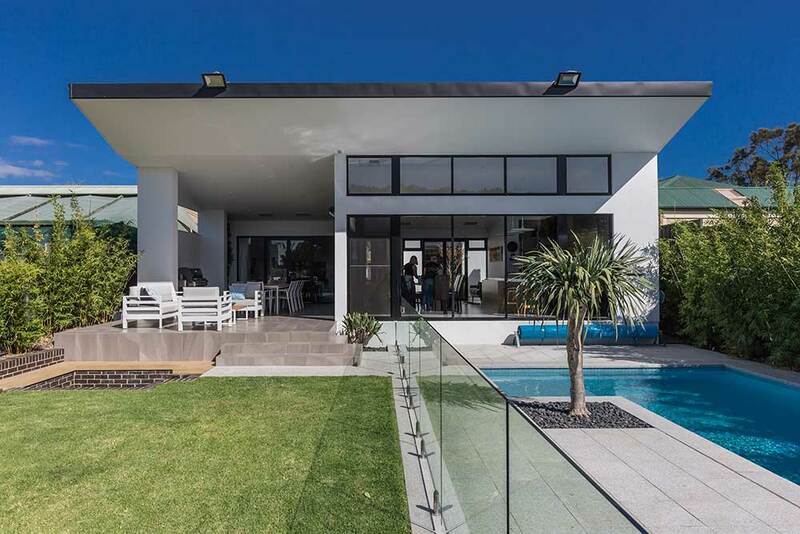 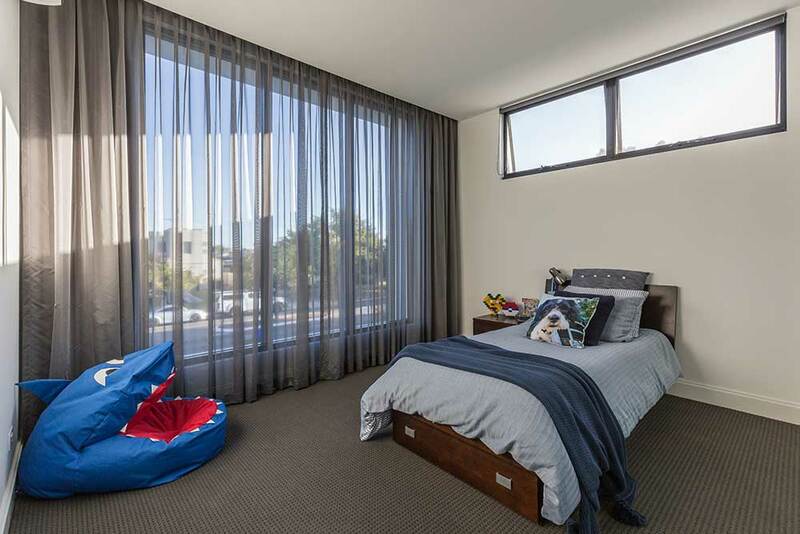 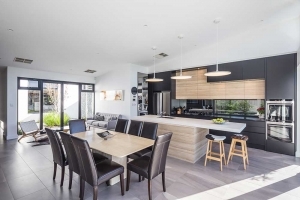 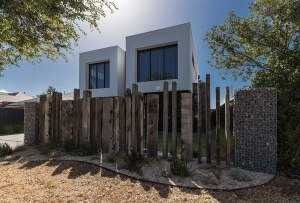 Overall, this home epitomises modern beachside living. The continuity of materials and design style throughout the home creates a common language between the interior and exterior. 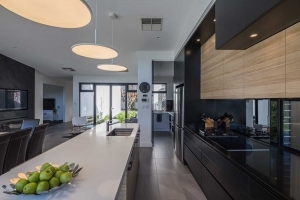 The home blends innovation, edgy style, high quality and precise workmanship.